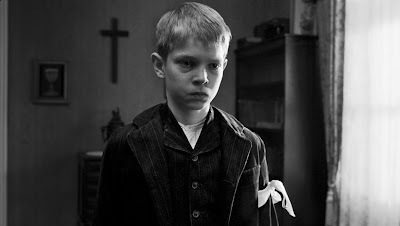 The White Ribbon (2009): From the extremely slow fade-in to the equally slow fade-out, The White Ribbon is a mystery. It does not resolve. It is uncomfortable and off-putting, at times forcing the viewer at an arm's distance. Yet it is also an absorbing narrative, filled with passion and sentiment, drawing the viewer into the midst of it. It is both objective and subjective, engaging and aloof, a masterful paradox of a film that will leave your questioning your own sense of judgment and faith. Strange and disturbing events begin to escalate in a tiny German village in 1913. A wire stretched between two trees causes the village doctor's horse to trip, breaking the doctor's collar bone in the fall. Someone put the wire there. We don't know who did it. Other terrible things begin to happen. A woman falls through an attic floor and dies. A child goes missing and is found severely beaten. A barn is burned in the night. 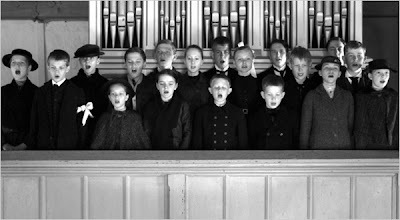 The events are revealed with somewhat cold objectivity by the film's narrator, the village school teacher telling the facts years after the events occurred. He offers little speculation, choosing to narrator simply what happened without offering explanation as, he admits, he simply doesn't have any. His own story centers around an awkward romance of a 17-year-old nanny to the baron who employs most of the village. They are innocent enough, but something about the entire film's tone makes their own actions suspect. In fact, no one appears innocent in this village. Everyone has a secret, a temper, a growing arousal to violence that boils under the surface. Especially the children. They have a shrewd look in their eyes, a look that exudes a loss of innocence. These are the children who will grow up to be the adults in Hitler's Germany. What could possibly shape an entire culture to the point that it would allow itself to be ruled by such a man as Hitler? They are not as innocent as they appear. Or maybe they are. Perhaps my own perceptions are not so objective. That is exactly filmmaker Michael Haneke's point. There are so many moments in the film where I had jumped to my own conclusions about what was occurring--or about to occur--in a particular scene, only to realize that my perceptions were entirely wrong. A coffin is shown pulled on a cart. Who is in it? We're never shown, but I have a hunch. Is my hunch correct? I don't know. Who is to say? Does Haneke even know? Does he even know who perpetrated the crimes? Look at the boy below, wearing a white ribbon on his arm, placed by his father (the village pastor) to remind him to remain pure and sinless in his behavior. Is this boy a victim or a criminal? Innocent or guilty? How do you know? What is his story, his thoughts, his emotions, his wounds, his insecurities, his dreams? How do you know you're correct? That is what makes this film so entirely unique--it invites the viewer to draw a number of their own conclusions which dramatically affect the entire perceived narrative. Thus, the "objective yet subjective" praise I lauded earlier. On a deeper level, The White Ribbon forces to ask the question, "why do bad things happen in our world?" What is the proper emotional and logical response to disaster, especially when those bad things are completely out of our control? Who is responsible for tragedy in our world? Us? Chance? The devil? God? Sin? Or a strange combination of all these elements? What causes an entire nation to bring about a tragedy like the Holocaust? Why did massive earthquakes kill thousands in the past few weeks? Haneke suggests that we may have our perceptions and our answers that allow us to sleep at night, but we can never fully know. This is not to suggest that there is no objective truth, but that sometimes the truth is far too mysterious and paradoxical for our minds to fully comprehend. God is like that. This is why we needed the incarnation, God revealing the truth in a Person, for us to begin to understand. Haneke shot this aesthetically beautiful film in color, then drained the color out of it to create a somber black-and-white tone. It is fitting, for this a film that is morally grey, a film where the answers lie just beyond our reach and we must simply come back to what matters most--faith. Glad you liked it. The more and more I think about it, the more it creeps up on my top ten of 2009 list. I think it's at least in the top three now. Cam, I'd put it in my top 5 of 2009, but not sure where. I think the film demands a second viewing. It sticks itself in your mind, and you find yourself thinking about it at random times throughout the day, wondering if you're putting the pieces together correctly. I also appreciate the spiritual elements of the film, including the puritanical pastor of the village. Haneke raises a number of questions about faith and morality, especially about our perceptions about people around us and the darkness that resides in their hearts. I'd also highly recommend Haneke's film "Cache" if you haven't seen it yet. It is equally troubling, frustrating, and wonderful.